Moving For Life’s co-founder and program designer, Martha Eddy who is also an Exercise Physiologist. Somatic Movement Therapist, Certified Movement Analyst and Dance Educator was featured in Dance Teacher Magazine. Learn all about our history and how inspired our teachers are around the country. Thank you Caitlin Sims for writing a thorough and sensitive account of Moving For Life! She includes quotes from our Bay Area MFL Certified Instructor (MFLCI) Melinda Teustchel and highlights the poignant story of one of our most active New York area MFLCI – Catherine Gross. 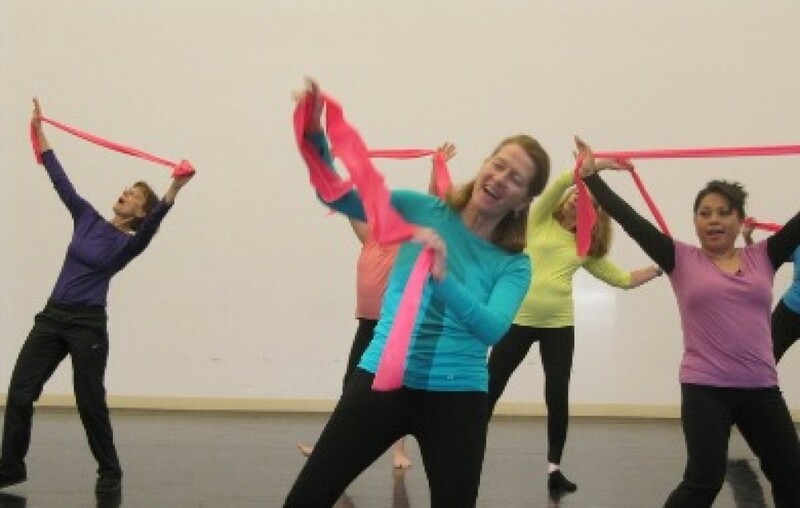 Martha Eddy has created a movement class to counter the side effects of cancer treatment. As Melinda Teutschel begins teaching an early afternoon Moving For Life class in Pleasant Hill, California, the dancers stand in a circle and close their eyes. “We’re going to find our breath,” she says. They move from a gentle warm-up through exercises that isolate and coordinate legs and arms, to a flowy aerobic section focused on balance and strength-building, then scatter to the walls for stretching. It takes a careful eye to realize that the program is created specifically for breast cancer patients, because, well, the participants are having so much fun. But this class is meticulously designed to be therapeutic, as well as invigorating. It is clear, however, that this has evolved beyond a movement class into a supportive community. When one student, who has had recent foot surgery, needs to elevate her leg, others offer ice, pillows and a blanket. Another who has had recent reconstructive surgery confers with Teutschel and rejoins the class with minor modifications. Moving For Life is an innovative program for breast cancer patients created by Martha Eddy in 1999. Eddy drew upon her knowledge of physiology, deep understanding of movement science and somatic education and the compassionate soul of an artist in creating MFL, which has spread beyond its New York roots across the U.S. to Japan, Canada and the Netherlands. The initial concept, not surprisingly, came from a breast cancer patient herself. Dr. Allison (Annie) Stern Rosen was fatigued, depressed and struggling to get off the couch after surgery and radiation. She flipped on the TV and saw exercise guru Richard Simmons. Although she wasn’t strong enough to do many of the exercises, she swayed to the music. After 10 minutes, she was surprised to feel better. From this came an idea: Why not create an exercise DVD for people recovering from breast cancer? Rosen turned to Jan Albert, a friend, television producer and documentary filmmaker. Albert knew Martha Eddy, a certified movement analyst trained in Laban/Bartenieff studies and licensed Body-Mind Centering teacher, who also has an EdD in movement science and education from Columbia University. MFL centers around a set “classic” class that progresses through specific exercises set to music. Eddy piloted it at Teachers College, Columbia University, with breast and ovarian cancer patients. When Rosen and Albert realized how expensive creating a video would be, they tabled the idea. But Eddy had already designed the class, so she took it to hospitals and cancer support programs in New York City. The class was successful enough that Eddy soon needed to train other teachers. She had already created her own teacher-training program called Dynamic Embodiment, blending elements of Laban/Bartenieff work and Body-Mind Centering; this program became the initial source of teachers for MFL. As the program has expanded beyond New York City, Eddy has set prerequisites for the teacher-training that can be completed elsewhere. Students then attend 30 MFL classes as apprentice teachers, complete a pedagogical workshop in New York and take an exam. In all, it’s about 100 hours of training. San Francisco–based Caitlin Sims is a former editor in chief of Dance Teacher. Catherine Gross came to Moving For Life as a participant and was so transformed by her experience that she became a MFL teacher. Catherine Gross was introduced to Moving For Life while she was undergoing chemotherapy for breast cancer. “I felt at home right away,” she says. “It was safe; it was organic. The fact that I could move made a huge difference psychologically.” Gross appreciated the fact that the class could adjust to her changing needs during recovery, and that it was tailored specifically for breast cancer patients. When asked if she brings something extra to teaching because of her own experience as a patient, she demurs. “I think that all the MFL teachers are very sensitive to students’ needs,” she says. She acknowledges it can be inspiring for students to see the journey she has taken from student to teacher. And that she understands completely the feeling of having the world turned upside down by a cancer diagnosis. The bottom line: Moving For Life can assist in maintaining healthy weight levels and body mass ratio of lean tissue to fat which in turn can support NOT Having a Recurrence of CANCER. However its imperative that women have easy access to on-going classes even 6 months after treatment. We are working to raise funds to provide MFL’s safe, MD endorsed, finely designed classes for women in recovery from breast cancer. Moving For Life is open to participate in other studies on its impact on other types of cancer recovery and illness reduction. Purpose: Weight loss after breast cancer diagnosis has been associated with a decrease in risk of breast cancer recurrence and mortality. The purpose of this study is to examine the barriers, acceptance, and sustainability of an exercise intervention program offered at our institution to over- weight women with newly diagnosed breast cancer. Methods: The Breast Cancer Database was queried for women newly diagnosed with breast cancer and a body mass index (BMI) ≥ 25 kg/m2. Eligible patients participated in the Moving for Life (MFL) exercise program for 16 sessions. Questionnaires were administered. Statistical analyses included descriptives and paired t-tests to summarize patient characteristics and assess changes over time. Results: Of 40 patients, 22 declined, 18 consented and 13 (72%) completed the study. The mean age was 61 years (range: 38 – 76). The mean BMI was 31 kg/m2. After the intervention, there was a decrease in weight and BMI (p = 0.04). The average weight loss was 10 lbs. Participants reported greater enjoyment of exercise (p = 0.02) and decreased pain related to treatment (p = 0.05). These initial positive results were not maintained after 6 months and 1 year. Conclusions: The MFL intervention had a high rate of acceptance among overweight women newly diagnosed with breast cancer. These results demonstrated significant benefits of exercise immediately after cancer diagnosis and highlight the importance of developing sustainable lifestyle interventions. Interventions targeted at modifiable lifestyle factors in women with early stage disease may provide benefit that is comparable to certain adjuvant systemic therapies. Therefore, adjuvant lifestyle interventions supported by clinicians may improve breast cancer survival outcomes.